Whether it’s a requirement specification, a requirement specification in classic IT projects or a vision document in agile projects, objectiF RM will support you in your project. These documents describe the goals and requirements of stakeholders and create more requirements engineering artifacts, like use cases, test cases and diagrams, etc. They form the foundation for cooperation between contractors and clients or stakeholders and the development team. But creating these central documents and keeping them up to date is a lot of work with MS Word alone, and subject to error. objectiF RM provides ongoing tool support. objectiF RM uses templates to create complex documents. 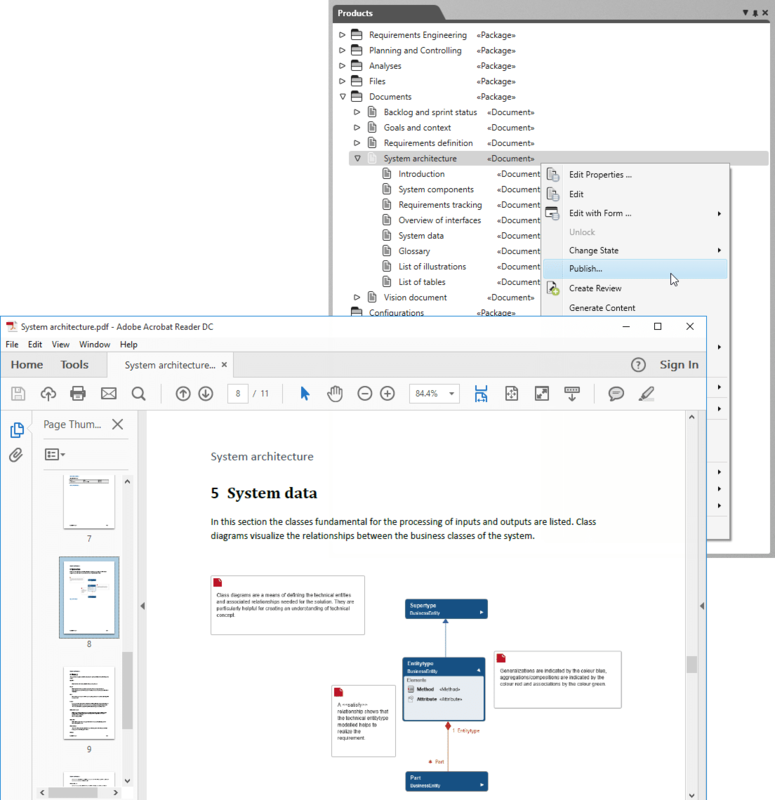 There are templates available for whole documents like requirement specification documents, individual chapters and for presenting artifacts, diagrams, and table evaluations within a chapter. You can use the templates straight away, adapt them, combine them into a new document or supplement them with your own templates. Don’t worry about the cover sheet with project information, contents page, index of tables and graphics or the glossary of the document. 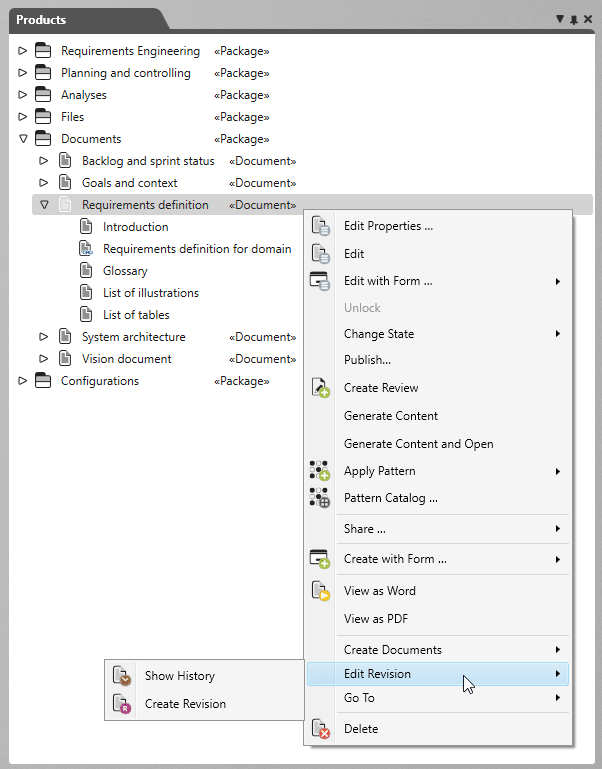 That is all automatically generated by the chapter templates and updated when the document is generated. This saves valuable time. Templates can be exchanged between projects. Templates ensure that documentation is structured the same in all projects. Templates can contain instructions for filling them out that guide the user when creating a document. This way the documents don’t require setup time and training. The chapters of a document can be edited collaboratively. With a click of the mouse, a finished chapter can be generated into a document’s complete MS Word file. An example of chapter structure for a requirement document: Each chapter is created from a template. The entire document, or, as seen here, just a chapter of an MS Word document can be generated with the feature Generate Content and Open. You can then edit it wherever you like. The changes will be sent to objectiF RM when it is saved and closed. You can generate revisions for every document, and even independently fror individual chapters, if necessary. Revisions are automatically created when events occur that lead to change in the editing state, like accepting documents after a review. The event-dependent and condition-dependent behavior of documents is controlled in objectiF RM with an adaptable state machine – just like for all other artifacts. A document’s development is traceable with the automatically generated history. Existing revisions or old development states can be seen at any time, compared with each other and exchanged with other projects. Previous development states can be restored where needed. 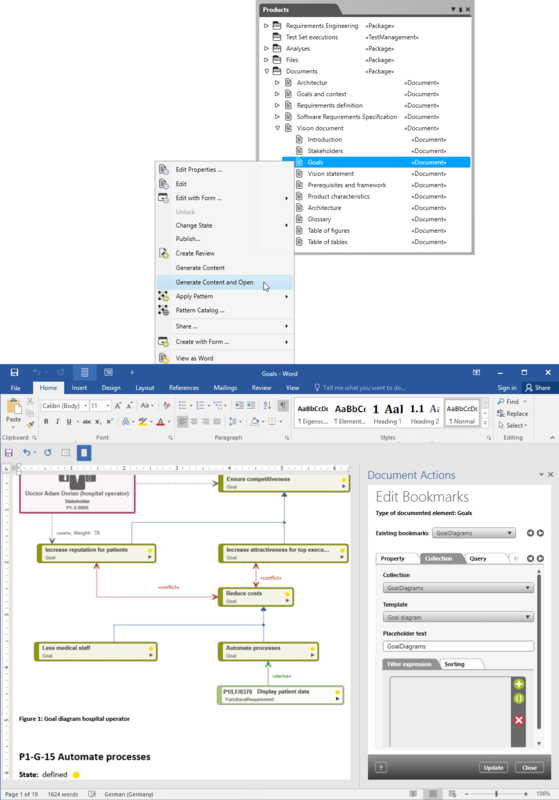 Adapting document state machines for documents lets you realize custom workflows. For example, this is what the short history of a recently created chapter looks like. Have you intensively edited a chapter and want to both version and save the new state? No problem: Like with all objectiF RM artifacts, the command Create Revision can be found on every document and every chapter. You can share the document with the stakeholders easily via an automatically generated email that contains a link to the document. Or generate the document into a PDF file. This option is best when stakeholders cannot or do not have permission to access objectiF RM. Structural clarity and currency is ensured through the using consistent templates and generating project contents into MS word documentation. But what about the quality of your documents? These questions can be answered with reviews. Participate in a review from different locations. The workflow for asynchronous document reviews – like for goals, requirements, risks, use cases and configurations – can be adapted to the procedures at your organization. 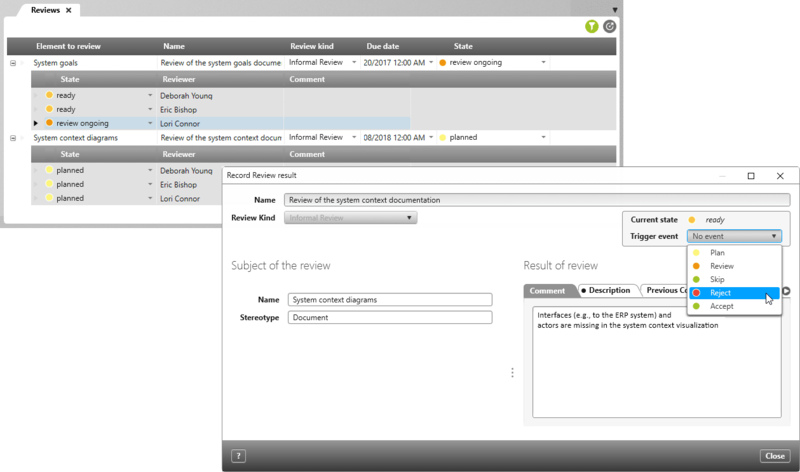 The ongoing and planned review processes are always transparent through state following in real-time evaluations and email notifications. The evaluation of a document is recorded structurally by every reviewer. You can easily achieve an overview of the state of quality assurance with the list of all ongoing reviews.